A friend and I were talking about our kids last week and the new things that are happening as a result of them getting older (first girlfriend and first job other than delivering a newspaper, in my house, freedom to bike farther from home in hers). It's exciting to see our kids growing up and becoming more independent. Back when my boys were toddlers, I had older women say to me, "I wish mine were that young again!" I couldn't, and still don't, understand it. Maybe I'm just not sentimental enough. I was never the one to cry when they started school, either. I love watching my boys grow up and seeing each new level of maturity and independence. I love who they are becoming and in no way do I want to take them back to when they were small and fully dependent on us. Growing up, after all, is exactly what they're supposed to be doing! Growing up doesn't stop when we become adults, though, or at least it shouldn't. We may not get taller (I certainly haven't, lol), but we should be constantly learning and growing wiser. The writer of the book of Hebrews wrote, "There is much more we would like to say about this, but it is difficult to explain, especially since you are spiritually dull and don’t seem to listen. You have been believers so long now that you ought to be teaching others. Instead, you need someone to teach you again the basic things about God’s word" (Hebrews 5:11,12). There is so much to think about in these two verses! Let's take a look. First, the writer calls the recipients of this letter "spiritually dull" and says they "don't seem to listen." He's not saying they're stupid so much as saying they're not paying attention and so they're not taking in what is being taught to them. Have you ever tried to talk to someone who is tuning you out? They have this look on their faces that just tells you that your words might be going into their ears, but they're not grasping what you're saying. That's what these Hebrew believers were like. They were hearing about the grace of God, but it was pretty much going in one ear and out the other. Are we spiritually dull? Or are we engaged, paying attention and fully taking in what we are being taught about God? "You have been believers so long now that you ought to be teaching others." Do you sense the writer's frustration? These believers were not new to their faith. In fact, they had been believers long enough that it would be reasonable to expect them to be comfortable explaining the foundations of their faith to others. It's interesting, too, that this progression to being able to teach others isn't being directed at people who were training to be pastors or some other kind of official leader. These were just ordinary believers, but the expectation was for them to move on to teaching others in some capacity. Do we understand the faith enough to be capable of teaching others? Teaching doesn't necessarily mean we have to be on a stage teaching a crowd. Maybe we're talking with our children or teaching a group of kids during Sunday school or even just explaining what we believe to a friend who doesn't yet believe. "You need someone to teach you again the basic things about God’s word." If a person isn't paying attention, then they will need to be taught the same things over and over again, until they finally pay attention enough for the lesson to sink in. There are basics of the faith that every believer must understand before they can live in the freedom that Jesus has given us. Most notably, we need to understand the our salvation is a gift, not something we have earned by our own efforts (Ephesians 2:8,9). Do we keep hearing the same message over and over? Maybe that's God trying to get our attention and teach us something we've been missing even though we've heard it before. We have to grasp a lesson before we can move on to the next one. Just like I don't want my boys to stay in the same stage of physical development forever, so I don't want to stay stuck in the same spiritual stage of development. 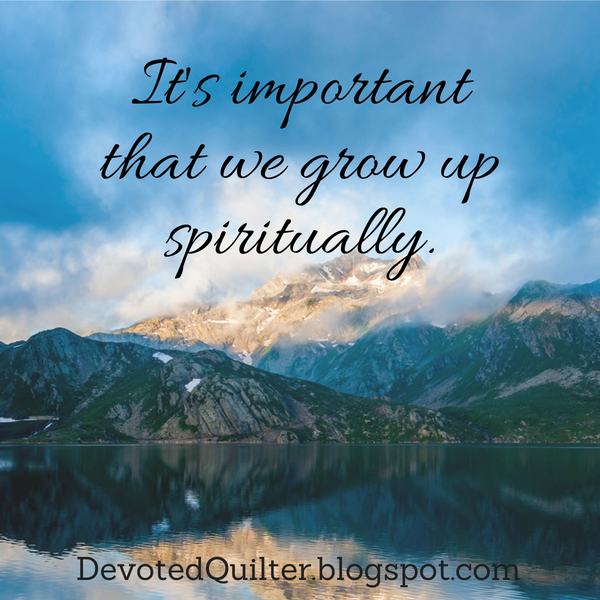 It's important that we grow up spiritually.